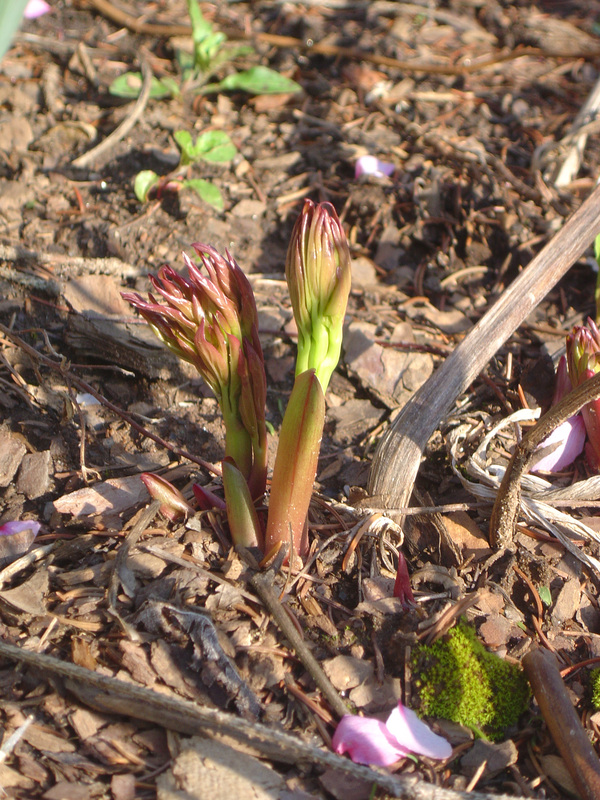 ‘Tis the season to scratch your head and wonder “What the Hell is that?” Seriously, I look to see if the peonies are coming up yet (they are) and some interesting looking red stem with palm-like leaves (mystery plant #1, below) is coming up right beside it. At first I thought it was another peony, but now that both are getting taller I can see they’re completely different structurally. 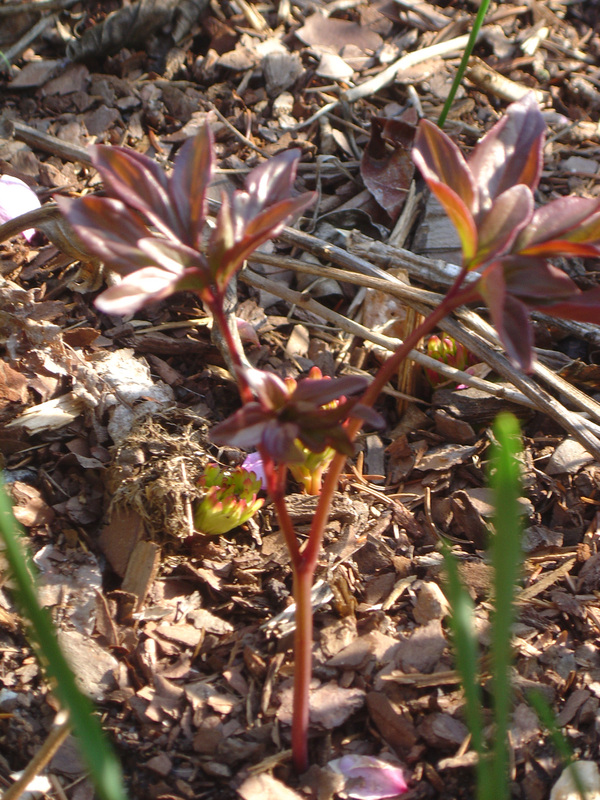 The peonies are much thicker and greener, the mystery plant is very thin and bright red. It’s like this all over the garden. Plants I know, plants I can put a name to and remember when I planted them, are right where they should be (if a little early — thank you unseasonably warm weather), and weird, random things are sprouting alongside. If anyone recognizes any of these volunteers, please leave an ID or guess in the comments. If not, I’ll post more pix in a month or so when we’ll have more growth and maybe some blooms. Mystery plant #2 seems way too small to be wild primrose, which seems to grow to about 4-5 feet around here, although the leaves look similar. 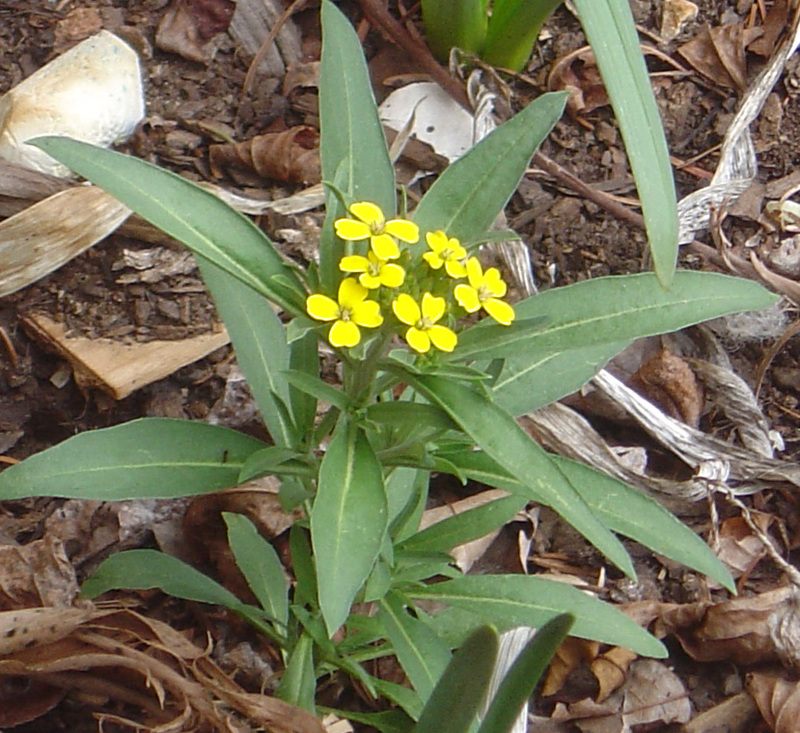 It over-wintered as a very small plant, then put on a quick burst of growth and bloomed a few days ago. Could easily be a seed dropped by a bird, or something blown in from a neighbor? Mystery plant #3 is tiny so far, but growing rapidly in full sun. It could be something that hitched a ride in the compost I put down in this area (which came from a cold pile, so some seeds may not have been killed off — a pepper, maybe?) or a refugee from some unsuccessful pack of seeds. Sometimes, it can be difficult to tell what’s deliberately planted and what isn’t because some seeds take such a long time to germinate. Right now there are columbine coming up all over the place because I planted seeds two years ago, and nothing came up last year. I planted some again, and I suspect the seedlings that I’m seeing now are the result of the first batch of seeds. Mystery plant #4 looks like a lettuce right now, but I know it isn’t. I’m pretty sure this was part of some pack of seeds my kids brought home from a birthday party a couple of years ago. It was the only species of flower from that pack (“native wildflowers” or “butterfly garden” or some such) that grew to maturity last year, and produced mid-size pink flowers (with just a couple of large petals) on 8-10 inch stems. A member of the poppy family, maybe? It sees to have overwintered just fine, and these cool little green leaves speckled with pink/ruby spots are interesting. It’s growing in full sun, if that helps. While it’s gratifying to see plants you put hard work into nurturing, feeding and weeding come back every year, part of the fun is also in the unexpected chaos of the garden. The plant that decides not to bloom one year and flourishes the next, the unexpected guest that hitches a ride in that clump of daylilies you harvested from an overgrown roadside, and the mysterious volunteer that sprouts from something borne on the wind all add an element of surprise and delight to even the most carefully planned garden. 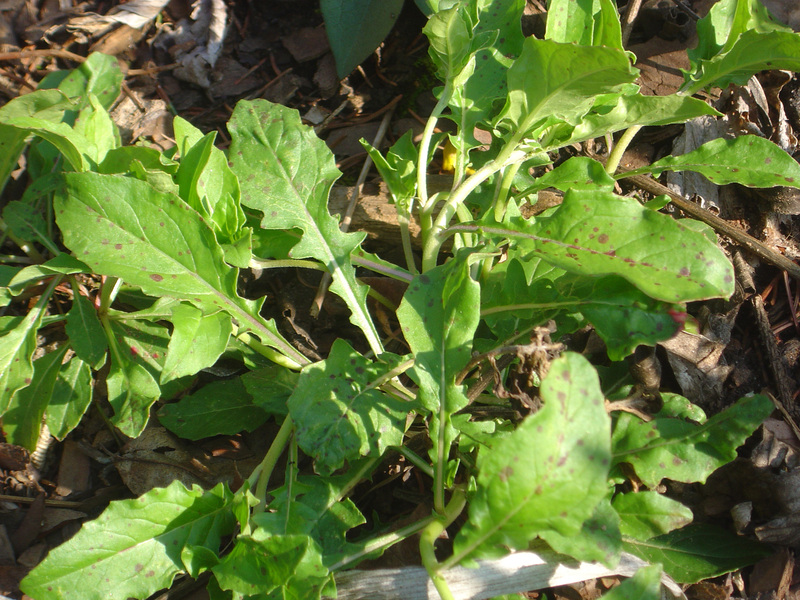 Some of these mystery plants will likely be keepers, others doubtless invasive weeds. Any guesses or confident plant IDs would be appreciated. Rich, thanks for stopping by my corner of Katy! 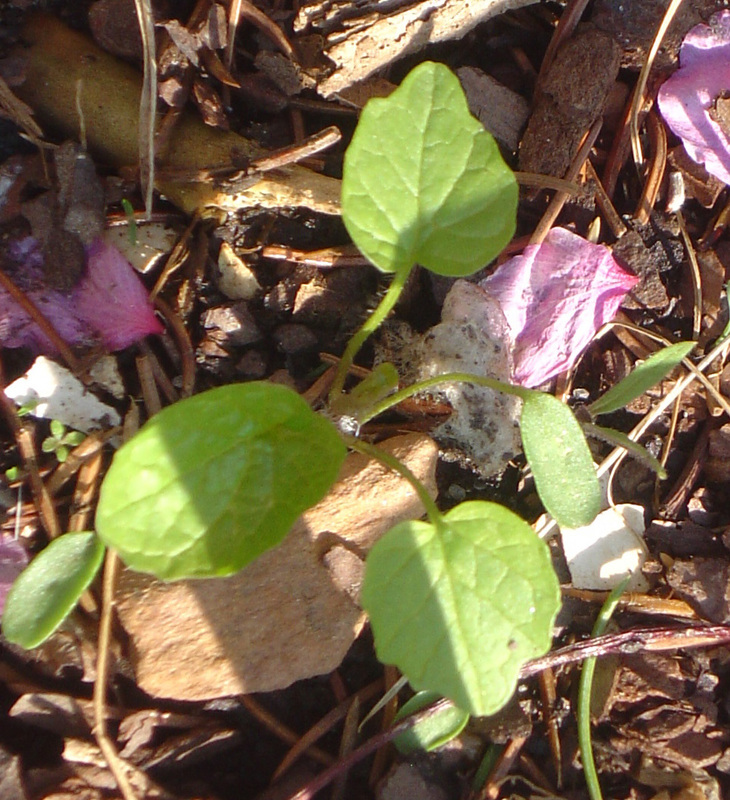 I know mystery plant #4 is definitely a weed: yank it now! I’ve seen it IDed as Youngia japonica. The flower on #2 looks an awful lot like false mustard/wild mustard. Offline, somebody ID myst #1 as a peony. The peonies in the first, unnumbered, pic are several years old. Maybe myst #1 is a first year peony growing from seed? The pics of Japonica I found online don’t look much like the plant when it flowers, though. The flower shapes are very different — although that might just be my memory letting me down. I’ll keep an eye on it.